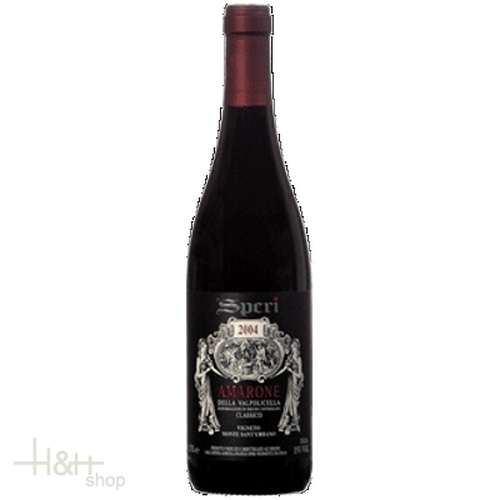 Undisputedly symbolic of the Speri company, the Amarone Monte Sant'Urbano is a superb example of a fine, classic wine. It is an extraordinary wine with great complexity and a vigorous structure which has always been top for its elegance and quality. After carefully selecting the best bunches the prestigious Monte Sant'Urbano vineyard, the grapes are left to dry for a long period (3-4 months depending on the vintage year). This creates a wine with plenty of structure and softness which will certainly age well. GRAPE VARIETIES: Corvina veronese 70%, Rondinella 25%, Corvinone 5%. VINEYARD: Monte Sant'Urbano estate, in the municipality of Fumane. It extends over a surface area of 19 hectares. Situated on a hill at an altitude of 280 - 350 metres above sea level, the Monte Sant'Urbano vineyard enjoys an excellent exposure to the sun. The calcareous, clayey terrain, of volcanic origin, favors retention of moisture, preventing excessive dryness. CULTIVATION SYSTEM: Verona pergola system placed on ledges sustained by dry stone walls known as "marogne". A density of 3300 vines per hectare guarantees a yield of 98 quintals per hectare. The vines have an average age of 18 years. HARVEST: Manual selection of the best bunches end of September/beginning of October. Withering for about 120 days in fruit-drying rooms with ideal conditions in terms of temperature, humidity and ventilation. Loss of 40% of initial weight with a considerable increase in the quantity of sugar. VINIFICATION: Pressing in the middle of January with a roller crusher-destemmer. Maceration at 16°-18° C of temperature in stainless steel tanks for a period of 36 days with periodic pumping over and délestage. Separation of the skins end of February and completion alcoholic and malolactic fermentation in 500 l. oak barrels. Ageing in 500 l Allier oak casks for 24 months and in 20-40 hl. Slovenian oak barrels for 12 months. Refinement in the bottle. Garnet in colour and on the nose, wide and complex with hints of violet and forest fruit aromas. On the palate, full and velvety and well balanced. Due to its structure and characteristics, it is a perfect match for meat and game dishes, and tasty cheeses. the perfect structure but with tannins already soft and open and intense perfumes that give to this Barolo characteristics of power and great elegance. Complex and fragrant when drunk young but with great potential for the ageing. To dive into the world of the cheese, to enjoy great moments in society or to give a nice surprise: a DEGUSTation is an ideal opportunity. Let yourselves be carried away in a wonderful world of pleasure by the fanciful created cheese specialities the affineur and cheese pope's Hansi Baumgartner. The arrangement of the DEGUSTation is new every time and it's a surprise. With attached info sheet the order of tasting the single specialities is exactly explained. The DEGUSTation for 4 persons contains at least 6 different cheese types with a total weight of approx. 1 kg. and the fitting chutney(s).